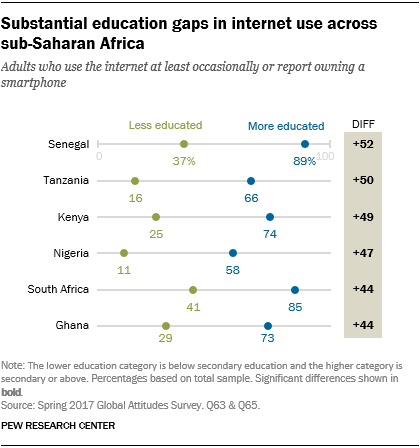 Across the six sub-Saharan African countries surveyed, a median of 41% say they use the internet occasionally or own an internet-capable smartphone. 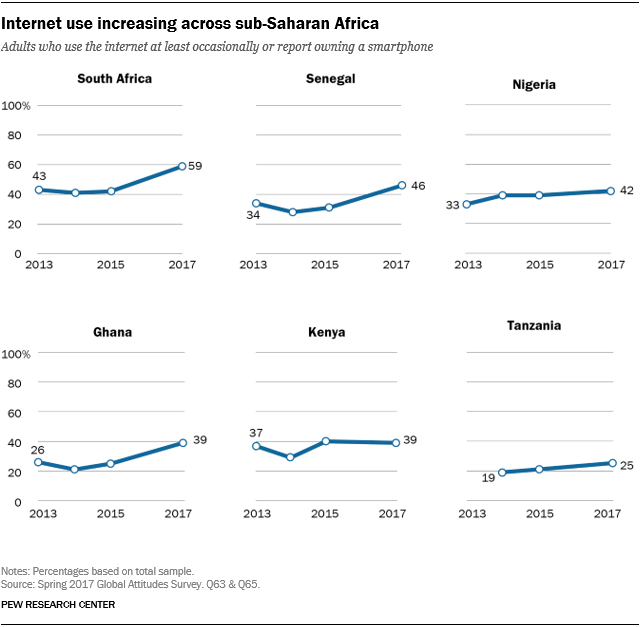 Sub-Saharan Africa has a lower level of internet use than any other geographic region, ranging from a high of 59% in South Africa to a low of 25% in Tanzania. For comparison, 89% of Americans said they use the internet in a January 2018 Pew Research Center survey. While internet use among many of the world’s advanced economies has plateaued in recent years, internet use has increased in Ghana, Nigeria, Senegal and South Africa since 2013, and in Tanzania since 2014. For example, 26% of Ghanaians reported using the internet in 2013, compared with 39% in 2017. Usage rates in Kenya stayed relatively stable during this time period. Divides in internet use are similar to those found for mobile and smartphone ownership, with more educated, younger and higher-income people being more likely to go online. In most countries, men are also more likely than women to use the internet. As with smartphone ownership, adults younger than 30 are more likely than those ages 50 and older to go online. 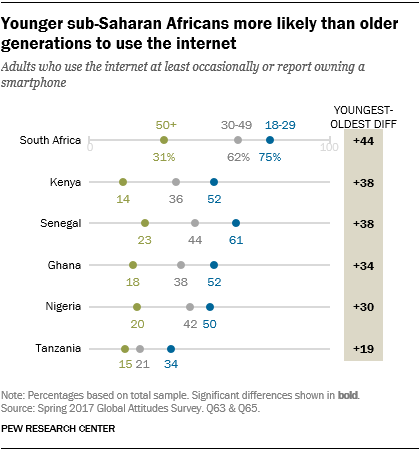 In South Africa, for example, 75% of people ages 18 to 29 report using the internet, compared with only 31% of people 50 and older. For more on these demographic differences in internet use, see the detailed tables in Appendix A. Among those who go online, the most commonly reported activity is staying in touch with friends and family. 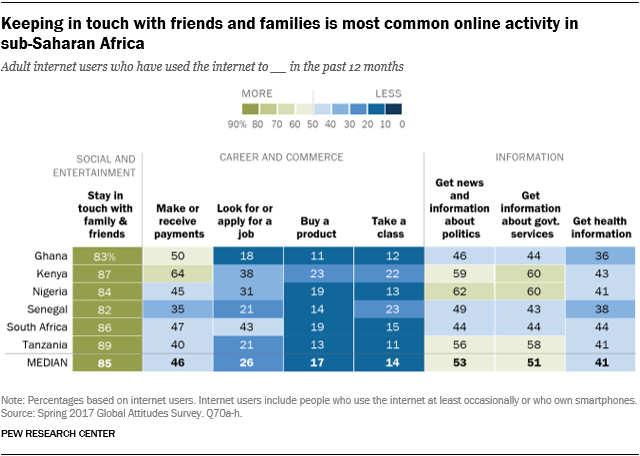 A median of 85% of sub-Saharan internet users say they have used the internet to stay in touch during the past 12 months, making it by far the most popular online activity. Information-gathering activities are somewhat less common than social activities, though some countries stand out. About half of internet users go online to access news and information about politics (a median of 53%) or to look up information about government services (51%). Only about four-in-ten (41%) report using the internet to find information about health or medicine. Kenya and Nigeria are notable as two countries in which more internet users are going online to get information: In both countries, around six-in-ten internet users say they go online to get political or government services information. The least-reported online activities relate to career and commerce. While a majority of mobile phone owners are using their devices to make or receive payments, a median of just 46% of internet users are going online to do the same. Even fewer internet users are using the medium to look for work (median of 26%), buy products (17%) or take online courses (14%). Unlike with mobile activities, older and poorer internet users are just as likely as their younger and richer counterparts to engage in all online activities asked about. However, in most countries, more-educated people are more likely use the internet to stay in touch with friends and family and to gather information, including looking up news about politics and getting health and medical information. People with more education are also more likely to use the internet to look for or apply for a job. Men and women tend to engage in online activities at similar rates; however, in all countries, male internet users are also more likely than female users to look for news and information about politics online. 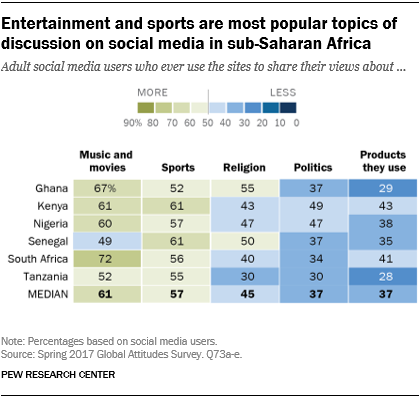 More than three-quarters of sub-Saharan Africans who go online also use social media sites. As with internet use, social media use is much more common among younger people, higher earners and those with more education. In every country but South Africa, male internet users are at least 13 percentage points more likely than female internet users to use social networking sites. Social media users are much more likely to use these sites to share their views about entertainment topics than about other issues. For example, majorities of social media users say they use social media to share their views about music and movies (a median of 61%) and sports (57%). Far fewer post about religion (45%), politics (37%) or products they use (37%).